AMUEEE 2018 (अलीगढ़ मुस्लिम विश्वविद्यालय इंजीनियरिंग प्रवेश परीक्षा): Aligarh Muslim University conducts AMU Engineering Entrance Exam for the admission in various engineering and architecture courses. The students can apply online for the AMUEEE Application Form 2018. The forms will be available from the month of January. The students have to submit the form before the due date so that they can take part in the entrance exam. The aspirants will be selected for the AMU Admission 2018 only on the basis of the marks obtained by them in the entrance exam. The students have to submit the AMU Engineering Application Form 2018 on the official website. The last date for the submission of the form is in the last week of February. 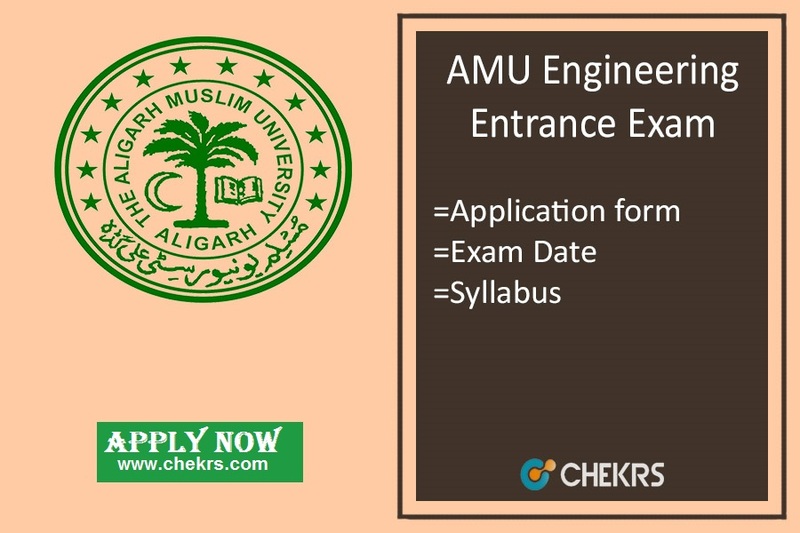 We will provide here the direct link for the submission of the AMU Engineering Entrance Exam Application Form. They just have to follow some precise procedure for the submission of the form successfully. Steps to submit the form for AMU Engineering Entrance Exam 2018. Now select the link regarding the online application. Start filling the form with your personal details carefully and correctly. Now attach the scammed copy of documents, photograph and signature along with the form. Next step is the payment of the application fee. After payment, submit the form by clicking on the submit button. The fees can be paid through online banking, credit card, debit card etc. It can also be paid via courier or speed post. They must have PCM as compulsory Subjects. They must have scored minimum 50% marks in their qualifying exam. The criteria are same as B.Tech. The student passed/ appearing 12tht Class from any recognized board. The NATA qualified students can also apply. The diploma holder students can also apply. They must have score minimum 50% marks in the qualifying exam. The aspirants have to check the AMU Engineering Entrance Exam Syllabus to start their preparations. They will be able to understand the topics of the exam from which the questions will be asked. The AMUEEE Syllabus Pdf will include the topics form the Physics, Chemistry, mathematics subjects of Class 11th & 12th level.